MACOM Enables 600G on a Single Wavelength for Long-haul/Metro Applications with 64 Gbaud Surface Mount Linear Modulator Driver Family | MACOM Technology Solutions Holdings, Inc.
LOWELL, Mass.--(BUSINESS WIRE)-- MACOM Technology Solutions Inc. ("MACOM"), today announced the MAOM-00641X series of three surface mount 64 Gbaud linear modulator drivers to enable the next generation of high capacity coherent transmission systems. Leveraging existing fiber installations, today's service providers are challenged to maximize their bandwidth and increase their data throughput-per-fiber. By maximizing the data rate on a single wavelength, operators can increase capacity and reduce the overall cost-per-bit of transmission. The transition to 100G has been enabled by coherent technology, while continued evolutions in PHY technology have provided the pathway to 200G, 400G and beyond. Due to the shorter reach requirements, metro networks can use higher order modulation formats up to 64 QAM at baud rates of 64G, to achieve data rates of 600G on a single wavelength. The next generation CFP2-ACO with 64G/64QAM capability, currently being standardized by the OIF, will therefore enable capacity of 4.8Tbps per RU - a 3X improvement over current solutions. 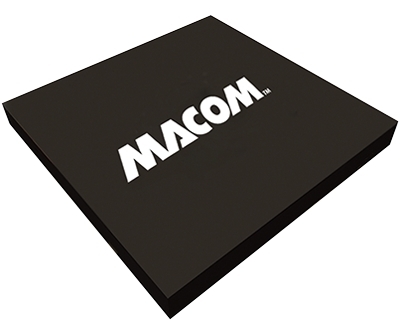 "These new products reinforce MACOM's leadership position in surface mount drivers for coherent applications. We have been sampling for several months now and we are very happy to see that our product is enabling one of our key customers to demonstrate a 64G ACO at OFC this week," said Ray Moroney, Vice President and Business Line Manager for MACOM's Metro and Long Haul Products. "MACOM's drivers are shipping in high volume in the current generation of CFP-DCO and CFP2-ACO and we are continuing to work closely with our module and system partners developing the next generation of pluggable coherent modules." The MAOM-00641X series of modulator drivers have differential inputs and single-ended outputs for use with indium phosphide and lithium niobate modulators. They are available in the 14mm x 9mm surface mount package which was pioneered by MACOM and has since become the de-facto standard for modulator drivers used in the CFP2-ACO. The devices boast high bandwidth to support 64 Gbaud and excellent linearity to support 64 QAM modulation, while power dissipation can be optimized for the specific type of modulator. MACOM's MAOM-006417 will be on display at OFC 2017, Booth #1736, March 21st-23rd in Los Angeles, CA. To make an appointment, contact your local sales representative. For more information on MACOM's broad optical and photonic portfolio visit: http://www.macom.com/opto.